The Chevrolet Malibu was launched to compete with mid-size imports such as the Honda Accord and Toyota Camry. The Malibu emphasizes civilized road manners, quality construction, and buttoned-down practicality wrapped in innocuous if not anonymous styling. The driving performance of the Malibu exceeded our expectations. We were surprised by the acceleration performance from the V6 and delighted by the crispness of handling on winding roads. It feels firmer than the Camry, but softer than the Accord, a good balance, in other words. Malibu's solid structure is based on GM's newly developed Epsilon platform used by a couple of highly successful European sedans. Along with its compliant suspension, this gives the Malibu a smooth, comfortable ride, yet allows for spirited driving. This is no mush-mobile. At the same time, steering effort is light at low speeds, making the Malibu easy to maneuver in crowded parking lots and other tight parking situations. The cabin offers roomy accommodations for four passengers, five if one of them is sufficiently slender to squeeze into the rear middle seat. The seats are comfortable and the controls are logical and easy to use. Malibu is quiet underway, and it offers a wide range of engine choices. No question, this is a highly competent sedan that's practical and easy to live with. The Malibu has something the imports don't: the Maxx. The Maxx is a long-wheelbase variant, whose extended roofline and rear cargo hatch suggest a sporty wagon. While Malibu seems destined to disappear into a crowd, Maxx looks just as determined to stand out and be noticed. For 2006, the Malibu SS models receive a new, 240-hp, 3.9-liter V6 coupled to a sport-shift automatic. Performance in these is even peppier yet, adding to the Malibu's overall promising lineup. Starting at just over $17,000 and topping out around $27,000 fully optioned, the Malibu is extremely competitive with the prices of the Honda Accord and Toyota Camry, which can approach $30,000 with options. 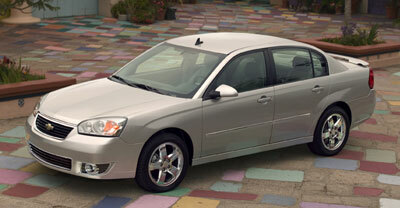 The 2006 Chevrolet Malibu is available as a conventional four-door sedan, or as the longer-wheelbase Malibu Maxx. The sedan comes in four trim levels: LS ($17,365), LT ($18,725), LTZ ($24,205) and SS ($23,865). The LS and LT are powered by a 2.2-liter dual overhead cam four-cylinder engine. The LTZ comes with a 3.5-liter overhead-valve V6, which is optional in the LT ($1560). The SS comes with a new, 3.9-liter overhead-valve V6. All models come with a four-speed automatic transmission; the SS adds a sport-shift function. Standard features at all levels include: air conditioning; a power, vertical-height adjuster for the driver's seat; power windows, door locks and outside mirrors; tilt/telescoping steering column; four-speaker stereo with compact disc player; and 205/65R15, all-season tires on hub-capped, steel wheels. An engine block heater is optional across the line ($50). The LT adds cruise control; remote vehicle starter and keyless entry; map lights; map pockets in the backs of the front seats; manual lumbar adjustment for the driver's seat; six-speaker stereo with the Radio Data System (which displays the kind of station you are listening to); 205/60R16 all-season tires on painted silver steel wheels; front and rear carpeted floor mats; and a cargo net. Options include a Front Seating Package with leather-appointed seats, six-way power adjustment for the driver's seat and heated front seats ($450); a Luxury and Convenience Package with the seating package plus electrochromic rearview mirror, lighted driver and passenger vanity mirrors, rear map lights, fog lamps and 16-inch chrome-trim wheels ($995); power-adjustable pedals ($125); XM Satellite Radio with three-month trial subscription ($325); six-disc in-dash CD changer ($300); and rear spoiler ($175). LTZ adds automatic climate control; leather-appointed seats; heated front seats; 6-way power driver's seat; leather-wrapped shift knob and steering wheel with steering wheel-mounted audio and cruise controls; power-adjustable pedals; front and rear map lights; two illuminated vanity mirrors in front; fog lamps; power, heated, manually foldable outside mirrors; body-color rocker moldings; a rear spoiler; P225/50R17 all-season tires on bright chrome aluminum alloy wheels; a Homelink transmitter for opening garages and security gates; one-year, pre-paid OnStar with on-line emergency notification, vehicle diagnostics and hands-free calling; and electrochromic rearview mirror. XM Satellite Radio and the six-disc, in-dash CD changer are optional. So is a power sunroof ($800). SS upgrades with leather-appointed sport seats; six-way power driver's seat; leather-wrapped shift knob; leather-wrapped steering wheel with audio and cruise controls; power-adjustable pedals; P225/50R18 all-season tires on machined, ultra-bright, aluminum alloy wheels; and fog lamps. Optional on the SS are XM radio, in-dash CD changer, sunroof. Summer performance tires ($150) and OnStar with a one-year pre-paid subscription ($695) are also optional. Maxx is built in three trim levels: LT ($21,025), LTZ ($24,755), and SS ($24,065). The Maxx LT is better equipped than its sedan counterpart, and comes with cruise control; P215/60R16, all-season tires on silver-painted, steel wheels; power hatch release; fore-and-aft adjustable rear seat; and other highline features. Similar options packages are available for the Maxx as for the sedan. Maxx exclusives include a rear-seat audio system with two wireless headphones and auxiliary jacks ($175 on the LT, standard on the LTZ and SS) and a DVD/CD rear-seat entertainment center with wireless headphones, remote control and a monitor that flips up from the front console ($995). Where the Malibu needs work is in the appearance department. Introduced as an all-new model for 2004, the Malibu is better looking than the plain-looking previous model, but it's no raving beauty. That silver band across the front is designed to clearly identify this as a Chevy, but it won't go down in history as a great design. The Chevrolet Malibu certainly looked more contemporary than its predecessor when it first appeared in 2003, with more character and class. It also looked more substantial, giving the impression it's a more expensive car than it is. The sedan's freshness has faded, however, increasingly looking like a collection of styling cues and surface planes gathered from here and there but not all that well integrated. Meanwhile, the Honda Accord, Toyota Camry and Hyundai Sonata have been replaced with new models. The Maxx has held up better, with its longer wheelbase and chopped off, rather stubby, but somehow sporty back end that, perhaps thankfully, none of the others has felt compelled to emulate. Both the sedan and the Maxx now wear an understated, monochromatic, single-piece fascia with almost generic lower air intake and grille, in which is centered the proper trademark, the Chevy bowtie. Angular headlights perch in the top corners of the fenders. Fog lamps, when present, occupy small, polished cutouts in the lower corners. The rear of the sedan resembles the upright rears of European cars more than any of the Asian-branded competition. And indeed, the Malibu shares its structure with the highly successful German Opel Vectra and the Swedish Saab 9-3, which provides a solid platform with the vital added benefit of good economies of scale. From the center post of its roof forward, the Maxx is identical to the sedan, including the updated front end. From there back, however, it's a different and more innovative vehicle, no larger than the sedan, but proportioned much differently. While the sedan is built on a 106-inch wheelbase, the Maxx rides on a wheelbase that's six inches longer, stretching to 112 inches. Yet in overall length the Maxx is a half-inch shorter than the sedan. Maxx is also a half-inch taller than the sedan. Its roof is longer, its trunk shorter, increasing space for rear-seat passengers. Again, more European than Asian, or even U.S., in roots. The Malibu looks as substantial inside as out. With 101 cubic feet of interior space, the sedan is extremely roomy front and rear. The seats are comfortable, although they could use a deeper seat bottom cushion with more thigh support. The front passenger seat cleverly folds flat in all but the SS models for carrying long objects such as skis. The rear seat splits and folds 60/40 for versatility when mixing cargo and passengers. The interior, the visual and tactile elements of which are shared with the Maxx, is conservatively styled. There's an off switch for the daytime running lights, useful when parked with the engine running. Controls on the center dash are conveniently backlit for night driving. Heating and air conditioning controls are quite logical. The stereo and information system are a little less so, but still more readily understood than many others. We thought the wipers were a little loud. And the triangularly shaped outside mirrors are small, limiting rearward vision more than we liked. Otherwise, it's a convenient interior. Lots of nooks and crannies are available for storage, including a center console with a roomy bin, four cupholders (though beware the two in the rear seat's fold-down center armrest, as it bounces enough over bumps to flip a cup of coffee into an unwary lap), a storage tray and a clip pad. Two 12-volt outlets provide power for whatever needs powering; the Maxx adds a third outlet in the cargo area. Malibu Maxx offers slightly more total passenger space than the sedan, at 106 cubic feet. But more than that, Maxx offers increased versatility. Its rear seat is split 60/40 not only in the back, but in the cushion; and each unit slides fore and aft as much as seven inches to adjust between passenger and cargo room. Rear-seat passengers sit farther back in the Maxx and enjoy nearly identical room as the front-seat occupants and as much as the rear-seat riders in a full-size domestic sedan. Also, the rear seatbacks recline for improved comfort. In short, the back seats of the Maxx are a comfortable place for adults. Standard in the Maxx are a pair of fixed skylights over the rear seating area, so rear-seat passengers can see clouds by day and stars by night. Or if it's sunny, they can close their individual sunshades. Back in the cargo bay, Maxx provides 22.8 cubic feet of space, versus 15.4 for the trunk of the sedan. Fold down Maxx's back seats and the available space expands to 41 cubic feet. There's a 12-volt power outlet way in the back in addition to the two up front that it shares with the sedan. A four-position shelf in back can be configured for two-tier loading or, with a drop-down leg, as a table for roadside picnics. There are hooks for hanging plastic grocery bags. And of course the one-piece liftgate with remote power release allows you to load objects like appliances that would never squeeze through the sedan's conventional trunk opening. The biggest problem with the Malibu's interior, whether sedan or Maxx, is its inconsistency. Some interior parts are made from high quality materials, such as the soft rubber door handles, which reminded us of Volkswagen, the benchmark for interiors. Yet other parts, such as the plastic surrounding the audio and climate controls, appear hard and cheap. The cover for the driver's seat-mounted, side-impact airbag left gaps around the edges. Several plastic pieces showed flash where the sides of the mold had clamped together. Although fit and finish was otherwise good, with decent tolerances between pieces, panels and fabrics, we didn't feel the interior generally measured up to the craftsmanship of a Honda, a Toyota or today, a Hyundai. A bumpy, winding road quickly showed us the Chevrolet Malibu handles well. Chevrolet engineers deliberately tuned the Malibu's ride and handling to fall between Accord firmness and Camry and Sonata softness. We think it was exactly the right decision. The Opel structure provides a quiet and comfortable ride yet allows spirited driving. The chassis is well controlled. The SS models feature a stiffer suspension, which transmits some harshness into the cabin. The electronically controlled steering is reasonably responsive, having overcome the spongy on-center feel and directional uncertainty in the technology's early years. Like all variable-assist systems, it provides the driver with more assistance at low speeds for parking maneuvers, with less power assistance at highway speeds for better steering feel. The SS comes with fatter tires that make for quicker and more precise turn in. GM's 2.2-liter, dual overhead cam, four-cylinder Ecotec engine serves as the base engine. Saddled with a car weighing more than 3000 pounds, its 144 horsepower delivers what's best described as casual acceleration. However, it does achieve an EPA-estimated 24/34 miles per gallon city/highway fuel economy rating. The 3.5-liter V6 delivers 200 horsepower while achieving 23/32 mpg in the sedan and 22/30 in the Maxx. We were pleased with its overall balance and smoothness, but wished for a bit more oomph for demanding maneuvers at highway speeds. The new 3.9-liter V6 that comes on the SS is a welcome upgrade. It's decently up to date, with variable valve timing and the like. It's quick off the line, thanks to the low engine speed at which its torque peaks, and its healthy measure of horsepower handles freeway on-ramps and high-speed passes with relative ease. There's a taste of front-wheel-drive syndrome (torque steer), where the steering wheel pulls this way and that during hard acceleration, but we've experienced more in cars costing more. Fuel economy takes a hit, dropping to 18/26 mpg city/highway, but it seems worth it for the improved performance. An SS-exclusive feature we found disappointing was the sport-shift mechanism on the transmission. This consisted of a small, rocker switch on the side of the top of the shift knob, hardly an intuitive approach. Seeing as how the gear selection is all done electronically anyway, why not a secondary slot in the shift gate where a driver can actually move the lever to select a gear? On the upside, the system did hold the chosen gear all the way up to the engine speed limiter and against every effort to force a downshift. Models with the four-cylinder engine come with front disc and rear drum brakes. V6 models get four-wheel disc brakes with ABS and traction control. ABS allows the driver to maintain steering control under hard braking, while traction control slows a spinning wheel as needed to restore grip. Technology aside, the firmness of the brake pedal impressed us and inspired confidence, as did the couple of times we felt the ABS step in to hasten our deceleration on wet roads. Along these lines, we're disappointed not to see any form of electronic stability control offered on the Malibu. The Chevrolet Malibu has a solid driving personality, a nice ride, a quiet, and a comfortable cabin. The Malibu Maxx is an attractive alternative with its liftgate, adjustable rear seating and some of the versatility of a small SUV, all in a package no larger than a mid-size sedan. And the new, more powerful V6 in the SS is a welcome addition. NewCarTestDrive.com correspondent Tom Lankard filed this report from Northern California. Head/hip/leg room, f: 39.4/53.5/41.9 in. Head/hip/leg room, r: 39.4/52.4/41.0 in. Cargo volume: 41.0 cu. ft. Towing capacity: not recommended Lbs.